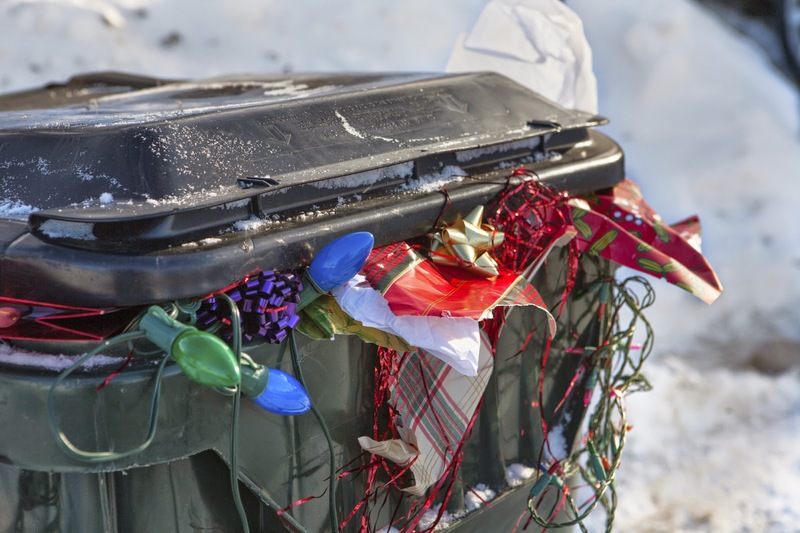 The holidays are a magical time of caring, sharing, family, friends, and.....trash? Around the holidays, many more families get together to share meals and exchange gifts. Along with the wonderful time spent with special people comes a lot of trash.....to the tune of about 1 million tons per week between Thanksgiving and New Year's Day. Added food waste, shopping bags, packaging, wrapping paper, bows and ribbons all add up to an estimated increase in household trash of about 25 percent. If there were any time during the year that the concept of Reduce, Reuse, Recycle is most important it would be during the latter part of November through the beginning of January. Cards - "An estimated 2.6 billion holiday cards are sold each year in the United States, enough to fill a football field 10 stories high. Electronic holiday greeting cards, offered through a variety of websites, are a convenient, no-cost, waste-free alternative." Ribbons -Although ribbons are a beautiful addition to any gift, making them almost to pretty to open, they ultimately end up as unnecessary waste. "If every family reused just two feet of holiday ribbon, the 38,000 miles of ribbon saved could tie a bow around the entire planet." Food - Larger meals are generally prepared this time of year, a generous portion of which gets thrown away. An estimated 28 billion pounds of edible food are wasted each year, which equates to over 100 pounds per person. This astonishing statistic could be reduced considerably if people would prepare smaller meals and use leftovers responsibly. Wrapping Paper -You can choose to wrap gifts in unconventional things such as maps, newspapers, the Sunday comics, or posters. You can choose to wrap gifts without a box and save ribbons, bows and bags to reuse in following years. Approximately half of the paper America consumes is used to wrap gifts and decorate. Disposable Dishes and Utensils - Avoid using disposable dishes and utensils when entertaining friends and family. If you must use them, buy items made from recycled or compostable material. Place easily identifiable recycling containers at your celebration so guests can recycle soda cans, bottles, and paper products. Holiday Trees - An estimated 33 million live Christmas trees are sold in North America every year, each of which has to be disposed of in some manner after the holidays. Some cities chip and shred them up to use for mulch, but so many of these trees end up in the landfill after they have exhausted their usefulness. The average American spends $800 on gifts over the holiday season. According to a national survey, 70% of Americans would welcome less emphasis on gift-giving and spending. About 40% of all battery sales occur during the holiday season. Buy rechargeable batteries to accompany your electronic gifts. They reduce the amount of potentially harmful materials thrown into landfills, and can save money in the long run. Transportation - If each family reduced holiday gasoline consumption by one gallon (only about twenty miles of driving in an average vehicle), we'd reduce greenhouse gas emissions by one million tons." The holiday season and the new year should be a beautifully magical time of year to enjoy family and friends, as well as reflect on the previous year and look forward to a brand new one. The unnecessary generation of an exorbitant amount of trash and/or recycling could be easily reduced or avoided with a few simple changes. To find out more about recyclable items visit www.wasteawaygroup.com.